Our good friend Russell wrote us a message last week; How is Di convalescing? Russ has a wonderful way with words. I was somewhat sure what he meant but I looked it up to be sure. Convalesce, verb: recover one's health and strength over a period of time after an illness or medical treatment. Synonyms: recuperate, get better, recover, get well, regain one's strength/health, get back on one's feet, get over something, get back to normal. That is exactly what we have been doing for the past week and a half since Di was discharged from hospital on July 11th. We have been housesitting in Hjortshøj, Denmark while our good friends Hanne, Jesper and Emma RG have been in London, England. Di is improving bit by bit, everyday. Not always as fast as we would like but things are moving in the right direction. We have decided to head to Copenhagen the middle of this week by ferry. I have not travelled this route in 35 years. Slowing down has allowed us more time with friends and family and has given us wonderful experiences we otherwise would have been without. Check the captions below to see what we have been up to. The main department store in Aarhus now has a Rooftop café. In the background, the city hall tower. We lived in Aarhus from 1988-93. Great to see many new initiatives such as the Aarhus Street Food Market. We stopped here for lunch with Emma, Simon and Ali. I have borrowed Jesper's bike for a couple of countryside rides around Hjortshøj. Everything is bone dry after the warmest summer anyone can recall. The fields stand bright yellow, a sight I have never seen. I have taken advantage of Jesper's new grand piano. Over the last couple of days I have composed a little piece, which may see the light of day, if I can manage to record all the notes without mistakes. I am a bit rusty as I haven't played much since I sold my own piano almost three years ago. None the less, it is very fulfilling to be playing again. 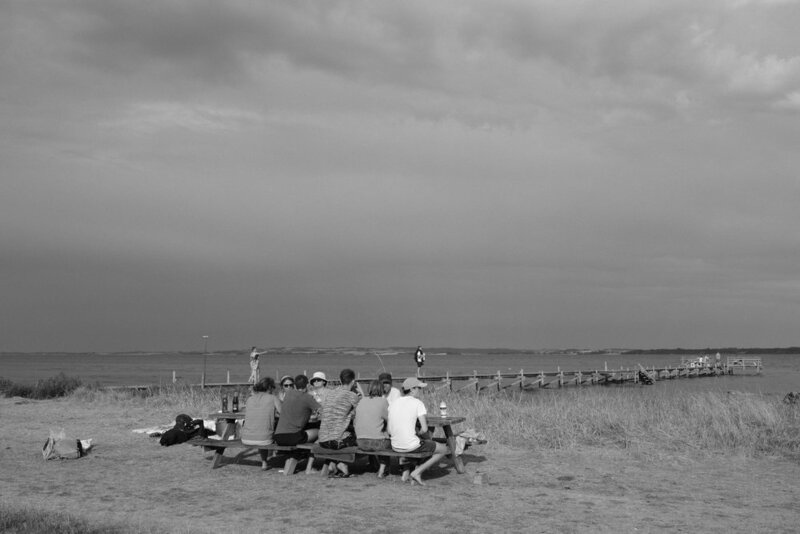 Simon's family joined us for a swim and evening picnic at the beach in Skæring. All the rage this year. Viking Chess / Kubb. From left to right: Ali - visiting from Canada, Emma and Simon's brother Jeppe. The dark clouds provided a gorgeous canvas, rainbow included, but only a light sprinkle. Wheat field near Assentoft where Simon's parents live. "Den Gamle By", The Old Town in Aarhus. Turn back time in "The Old Town", Aarhus. Di, Emma, Simon and Ali in "The Old Town" - "Old" is relative - apartment living - 1974. Inspecting the new Harbour Bath in Aarhus.....the ice cream is also highly recommended. Wrapping off with six photos from the beautiful "Mols Bjerge" / Mols Mountains. Denmark has no mountains to speak off, but they do rolling hills quite well.